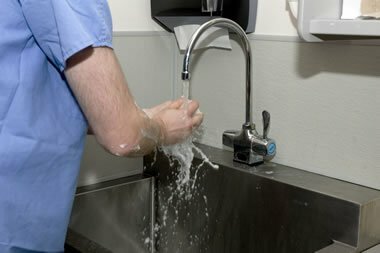 Pseudomonas Aeruginosa - What are the Dangers? You are here: Home / Knowledge / Compliance / Pseudomonas Aeruginosa – What are the Dangers? Pseudomonas Aeruginosa – What are the Dangers from this Opportunistic Bacteria? The chances are you may not be familiar with Pseudomonas aeruginosa. This is a bacterium that falls into the gammaproteobacteria class. Pseudomonas is a common gram-negative rod-shaped bacterium that is capable of causing disease in humans – particularly those that may potentially occur in hospitals. These are commonly-known as hospital-acquired infections or, more properly, nosocomial infections. Pseudomonas aeruginosa is a versatile and diverse bacterium that is capable of adjusting to live in many different situations. Pseudomonas in particular, is a cause of concern for the medical profession. This is because it is resistant to many different types of drugs that could otherwise be used to treat it once infection occurs. If someone is unfortunate enough to become infected by Pseudomonas, they may not be able to rely on antibiotics to make them better. Are vulnerable individuals more at risk? Instances of serious infections by this bacterium would seem to suggest that people who are already ill may be more prone to contracting the infection. It can occur in cases of pneumonia where the patient is on a ventilator, for example. Patients with cystic fibrosis may also be at greater risk of infection. However, there have been other cases where people have been infected by conditions triggered by Pseudomonas aeruginosa where they have not previously been ill.
What’s involved in the pseudomonas risk assessment process? A classic example of this would be hot tub folliculitis. This condition causes the hair follicles to become inflamed, giving the appearance of a rash of spots on the affected parts of the body. It earned the name because Pseudomonas aeruginosa is often found in water-based areas such as hot tubs. Ironically, antibiotics may be prescribed for this particular condition. However, it usually resolves on its own and most people would not need treatment. It is, however, a good idea to get a proper diagnosis of this condition. This may be helped by information on where the person has been in recent days, and whether they have used any similar sources of water. What other conditions could be caused by pseudomonas? There are several types of conditions that could be caused by this bacterium. Chest infections are common, with pneumonia the more serious presentation of this. Infections of the urinary tract and of wounds to the skin can also occur. The bacterium is also capable of getting into the bloodstream and causing septicaemia. On the whole, healthy individuals do not have to worry about being made ill by pseudomonas. It is far more common for poorly people – and even then, those who are very poorly – to be affected by it.